If you are planning that trip to Las Vegas and you are wondering where to take the kids this should give you an idea of the kind of money you will spend while entertaining the offspring. Important to note, if you are looking to be frugal while in Las Vegas consider the choice of hotel when making a decision on your Las Vegas vacation. Do a little research and compare room rates before booking. Saving a few extra dollars helps when the kids are in tow. Las Vegas Springs Preserve: Stroll through desert trails, indoor interactive exhibits, and various gardens. You will be impressed by this place and your children will have plenty of fun. Adventuredome Theme Park at Circus Circus: Rollercoaster, water ride, and carnival games. Yeah, the kids will hate it. You should consider spending at least 4 hours to play at Adventuredome. 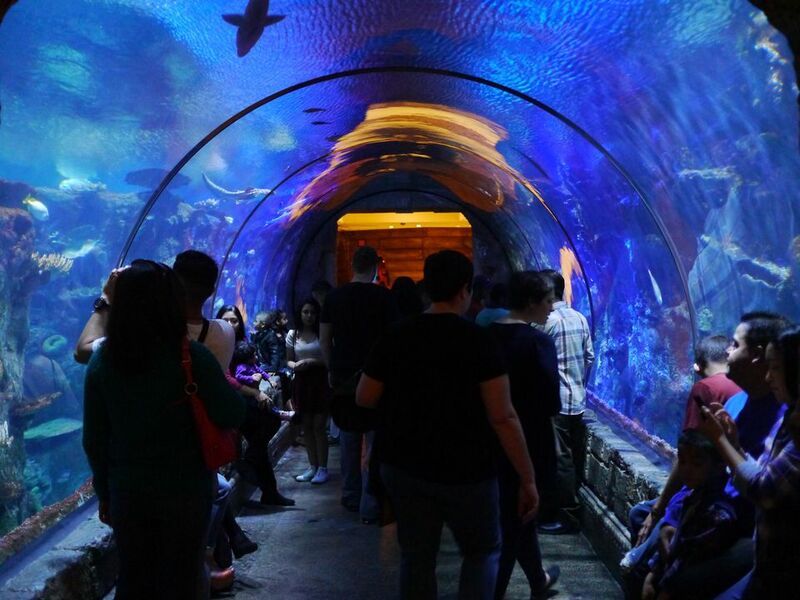 Shark Reef at Mandalay Bay: The Aquarium is nice but it can be expensive relative to other aquariums across the country. They do continue to improve the aquarium and it is looking very impressive. NY/NY: With a roller coaster and plenty of modern arcade games you might have as much fun as the kids. Gameworks: Located next to the MGM Grand Hotel this large arcade offers plenty of games and big screens that keep the adults as well as the kids entertained. Excalibur: My kids tend to leave the midway at Excalibur with far too many stuffed animals. Our last trip netted a guitar, two frogs, and an oversized basketball. At the Forum Shops at Caesars, you can visit the talking statues as well as the giant fish tank and cheap food options exist in the food court just inside the casino from the mall entrance. Of course, if you're looking to have a "Cheap Vacation," that is a relative term in Las Vegas because it all depends on if you include your gambling budget in your overall cost. I will assume that your budget for kids activities is different than your gambling budget. When you need to feed the kids, consider the ever convenient food courts. In Las Vegas, food courts can be quick, easy and cheap. The Venetian has plenty of options for your children at reasonable prices. If your kids are into sandwiches this could be your best bet for cheap meals. Try the Carnegie Deli at the Mirage. Order one sandwich and the entire family eats a decent meal. Is that stretching the budget enough? If you need a restaurant where you can take the kids you might want to try Margaritaville. While we know it might not be the best place for kids with alcohol and sailing music, you're already in Las Vegas you know, and they have a good kids menu and these giant pirates come around and make balloon animals for the kids. If the adults stay away from the Margarita's you might get away for a decent price. The Monte Carlo is more preferable for families because it is nice, relatively inexpensive, and it has fast food in their food court that includes McDonald's, Pizza, salads, and Starbucks. The Monte Carlo Pub and Brewery also has a decent kids menu. Across the street at the MGM Grand, you'll find theaters, Gameworks, and more fast food. Next door is the NY/NY and their arcades, roller coasters and virtual reality games. They also have a food court that is n cheap fast food. You are also steps from the Excalibur and the Luxor and each has places to entertain the kids. As for childcare, yes some hotels offer childcare and in the summer you can find the higher end resorts will have a kids club or two. We suggest that you find the hotel you will stay at and then ask them for references.